What Kind of Plastic Are You Eating Out of? There’s been a lot of talk recently about BPA and other ingredients in plastics that can have a negative effect on health. Let’s take a look at which plastics are safe, which ones aren’t, and how you can avoid having toxins leach out of your containers and into your food and drinks. There are two major plastics you want to avoid eating food out of, especially food that has been heated. Luckily, it’s easy to tell which these are, thanks to the little recycling logos you’ll find on the bottom of the container. If you see a 6 (polystyrine – think styrofoam) or a 3 (vinyl and PVC), avoid it. The other big thing to watch out for is BPA, which is a known endocrine disruptor. Some, but not all, BPA-containing plastics will be marked with a 7, so it’s a good idea to buy products specifically marked as BPA-free. If you do need to use products containing BPA, avoid microwaving them, washing them in extremely hot water, or using them to hold food and drinks that are very hot. Any plastic item marked with a 1, 2, 4, or 5 is not known to have carcinogenic tendencies or disrupt the endocrine system. Specifically, these plastics are called PET, PETE, HDPE, LDPE, and polypropylene. This generally includes items like drink bottles, containers that foods like margarine and yogurt might come in, and milk jugs. 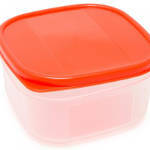 Remember too, though, that there are alternatives to plastic for storing and eating food, such as glass and ceramic, that do not contain any chemicals whatsoever that might leak into your food. 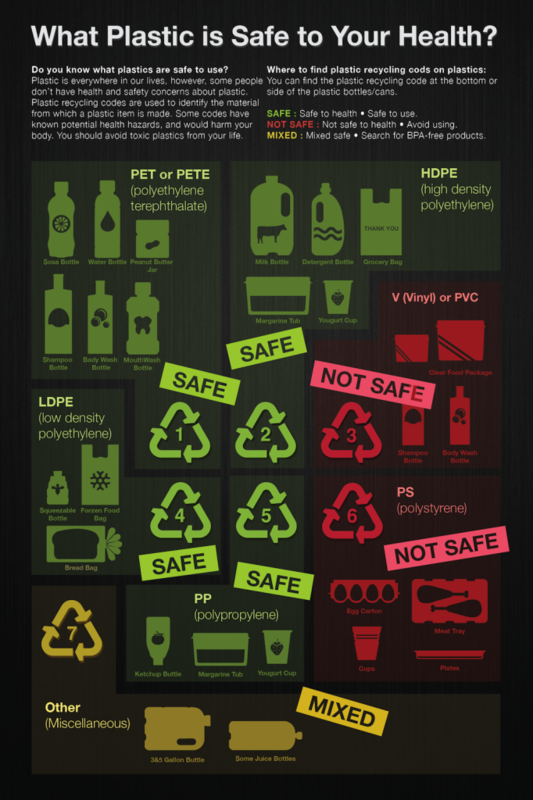 For a more extensive list of safe plastic items, check out the following infographic. Do you avoid certain types of plastic? What lead you to that decision? Latest Headlines » Wellness » What Kind of Plastic Are You Eating Out of?